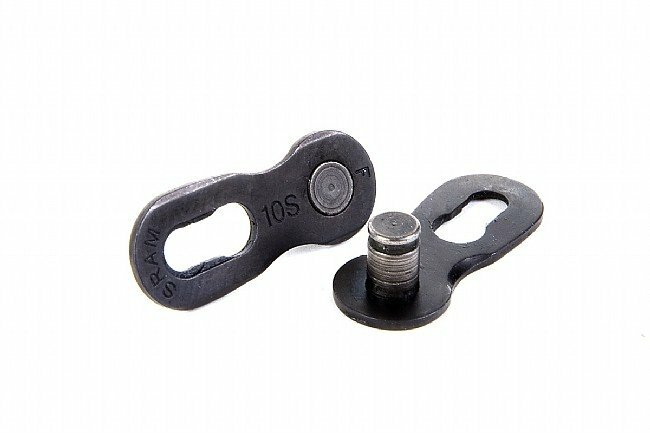 Replacement Powerlock tool-free link for SRAM 10-speed chains. SRAM recommends breaking their 10-speed chain with a chain tool to push a pin out and NOT to break the chain at the Powerlock link. When the chain is re-connected, a 10-speed Powerlock link must be used. Compatible with SRAM / Shimano 10-speed chains. Black. I stopped using pins to hold my chains together years ago when I discovered these links. The pin was always the weakest part of the chain. These links are every bit as strong as the rest of the chain and really easy to install. For the thousands of miles on multiple bikes I have used these I have never had one come apart on the road. Replace worn chain with new chain and link. No problems. These Powerlock links lock up tight and do not come apart. I've never had one come apart even when using multiple Powerlock links in the same chain. In fact, they lock up so tight that I can't get them apart without a tool. I've not been able to set them by hand either but can by stomping down on the pedal while holding the rear tire stationary. I've only broken one chain in a lifetime of cycling, but I've had several friends snap chains on group rides so I'd advise everyone to pack a Powerlock link. It takes almost no space in your saddlebag and will spare you lots of road or trailside headache...To fix a busted chain, just remove the damaged link(s) with chain tool, attach the Powerlock, and apply pedal force (with brakes)to snap the Powerlock into place-you're good to roll. I love the power lock. It's easy to install and remove (with the parker chain pliers). I keep a bunch on hand for when I really need to remove my chain for a good cleaning. Also I know it says you shouldn't re-use the link but in a pinch I have and had no problems. I bought these as spares, but one also came with my SRAM PC-1071 10-Speed Chain. The chain quick connect link is noted by SRAM to be a one time use item. It was difficult to engage, but seems to hold well. No issues after a few hundred miles. Great part to have in your kit to fix a broken chain on the road or trail. I've used these with Shimano and SRAM chains, and prefer them to Shimano's spare connector pins (which require you to snap off the leadguide section-hard to do wo a pliers). I was one mile into a 50 mile group ride when my chain suddenly came apart. In five minutes, thanks to the SRAM Powerlock Link, I was up and peddling again and back with the group, saving my ride for the day. These things are essential. I use with campy chain as well. I have also added these to all our chains to allow me to take them off the bike to clean the chains without pressing out pins. My sram chain 1091 is in great condition haven't had to use the power link. The 10 speed lock works great, but it is hard to snap it in to place. make sure to read the directions and use force of your pedal to get it on. By hand doesn't work like with the other powerlinks.